The Ideal Commercial Cow (ICC$) index for Holsteins is a Holstein sire ranking tool developed to meet the demands of GENEX customers. The ICC$ index addresses the needs of commercial dairy producers using real-time economic indicators, scientific principles and data-driven genetic evaluations from multiple sources. The ICC$ Index for Holsteins is made up of five sub-indexes: Production Efficiency (PREF$), Health (HLTH$), Fertility and Fitness (FYFT$), Milking Ability (MABL$), and Calving Ability (CABL$). Within these sub-indexes there are three proprietary traits. The Production Efficiency (PREF$) sub-index pinpoints genetics resulting in high yielding cows with lower feed costs. Emphasis is placed on pounds of protein. Use of PREF$ and ICC$ reverses the trend for taller cows. 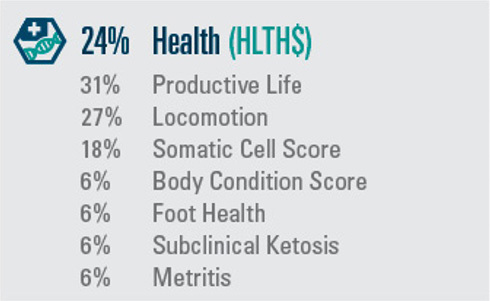 The Health (HLTH$) sub-index breeds for improved, sustainable health and longevity. High-ranking HLTH$ bulls have daughters with proper body condition, low somatic cell scores and excellent locomotion. With inclusion of the proprietary health traits SCK, MTR and FH, this sub-index also selects for lower predicted blood BHBA and fewer cases of metritis and lameness. With nine measures of cow and heifer fertility, Fertility and Fitness (FYFT$) meets the needs of producers looking to emphasize reproductive efficiency. Selection of bulls with high FYFT$ rankings results in optimal age at first calving, reduced days open and shorter calving intervals. Milking Ability (MABL$) optimizes efficiency with trouble-free milking cows. MABL$ includesmastitis resistance, milking speed and temperament, and ideal commercial udder conformation and function. Ideal udders have strong attachments; are above the hock; and include proper teat placement and length. Choosing bulls using MABL$ enhances udder texture and manages the emerging trend of short teat length. Calving Ability (CABL$) focuses on live calves born without difficulty. High-ranking CABL$ sires with high ICC$ values can maximize genetic progress in heifer pens while ensuring an easy transition into the milking string. Subclinical Ketosis (SCK) breeds for cows that transition better and have lower incidence of ketosis. SCK is set to a base of 100, meaning a value of 100 is average. Foot Health (FH) selection will lead to cows with fewer foot health issues. FH values come from a database containing more than 42 million health records and over 8.5 million cows. FH is set to a base of 100.